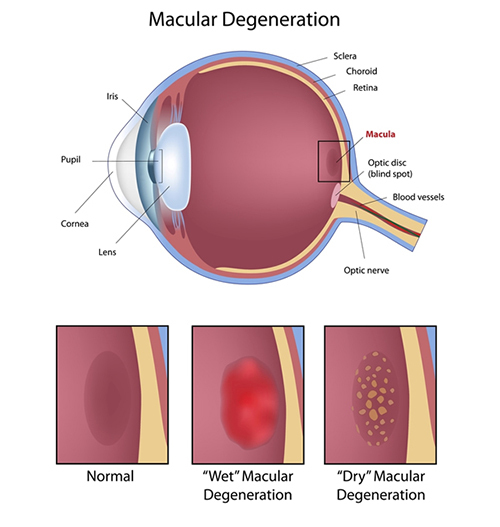 Age Related Macular Degeneration (ARMD) is a disease that results in deterioration of the central portion of the retina. This area is known as the macula, which provides detailed, straight-ahead vision. It is a small part of the retina, which is the inner lining of the eyeball. This process may result in central vision loss, as opposed to glaucoma which causes peripheral vision loss initially. There are two main types of ARMD: dry (85% of all ARMD cases) and wet (the remaining 15%). In the dry form, the macula may thin or demonstrate drusen, which look like yellow spots. Drusen are waste products produced by the retina (and macula) during normal functions required for sight. The waste products are not being removed as quickly as with normal maculae. This may affect central vision, but the level of loss has a wide scale. Some patients have no vision loss whatsoever, while the other extreme is blindness. Most patients however, are somewhere in between these two extremes. With time ARMD may or may not progress. If it continues to progress, reading, seeing faces, driving and other visual activities may diminish slowly. There is no treatment for dry ARMD, but ways to fight it consists of taking vitamins specifically for the eyes, and not smoking. Consuming leafy green vegetables such as broccoli, spinach and kale, along with nuts and berries have also been found to be helpful. When outdoors, one should always were UV protection sunglasses, even on overcast days. In the wet form, blood vessels begin to grow in and around the macula. This zone is typically clear and without vessels since that would interfere with sight. These vessels are fragile and can leak and bleed, causing sudden deterioration of sight. Treatment to try controlling wet ARMD consists of injections and laser. Castleman Eye Center has a retina specialist on staff to monitor and treat all types of macular degeneration. This convenience is greatly appreciated by many patients.